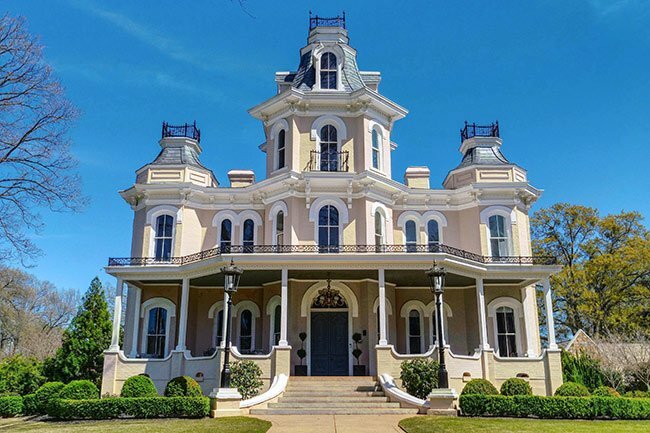 This Second Empire home in Greenville was built between 1876 and 1877 for mogul Charles Lanneau, founder of the Huguenot Plaid Mill in 1881. The mill, though located next to the Reedy River, utilized coal power rather than hydropower to weave plaid and gingham textiles. In fact, the Huguenot Plaid Mill was one of the first coal-powered textile plants in the Piedmont region of South Carolina. Lanneau became involved in the textile industry when he arrived to Greenville from Charleston to serve as treasurer of the Reedy River factory. He then opened a cotton mill, which burned, followed by the Huguenot Plaid Mill. Today the restored Huguenot Plaid Mill serves as office and conference space as part of the Peace Center. The home was acquired by banker and textile industry financier John Wilkins Norwood in 1907, following Lanneau’s death. That same year he organized Norwood National Bank and served as its president until the bank was consolidated in 1925 as part of South Carolina National Bank. Following the consolidation, Norwood served as president of the bank’s Greenville branch until 1933. Today the Lanneau-Norwood House remains a private residence. 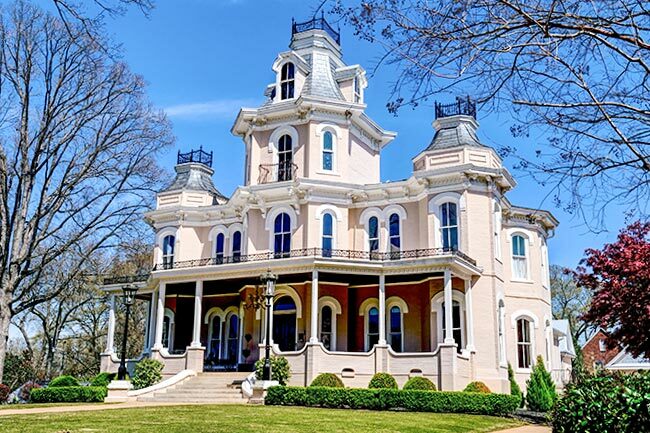 The Lanneau-Norwood House is an outstanding example of the Second Empire style and is associated with prominent residents of Greenville. The house is a two-and-one-half story brick mansion built for Charles H. Lanneau ca. 1877. The symmetrical façade features a central pavilion and tower and projecting corner pavilions. The tower is octagonal in shape and extends one and one-half stories above the cornice line of the main block of the house. A one-story front porch extends the full width of the façade and projects outward from the corner pavilions. The porch includes slender posts with scrolled brackets, a decorative cornice, and balustrades at roof level. The windows have round-arched lintels and granite sills. Lanneau organized the Huguenot Plaid Mill which was constructed in 1882. The house and associated parcel were acquired by John Wilkins Norwood from the Lanneau estate in 1907. Norwood was a prominent banker and businessman known for his contribution as a leading financier of the growing textile industry in North and South Carolina. The nominated property includes three outbuildings: a two-room, one-story brick servants’ quarters with a gable roof, a brick garage, and a small greenhouse. Thank you so much for the information about this historic house. I don’t know where else I might have found it without leaving my home and heading to a local library.